Put all ingredients in a pan and place over low heat. Dry-roast the spices until they get a light color and release their aroma. Grind the spices in a mortar or use a food processor. Place the fish in a baking dish. 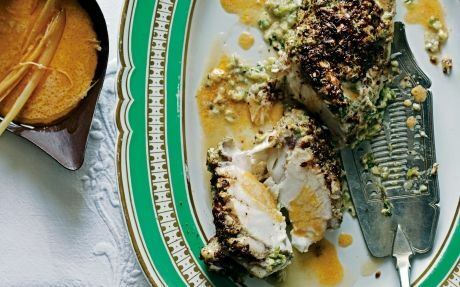 In a bowl, combine all the ingredients for the marinade and coat the fish with the mixture. Wrap it in clear film and put in the refrigerator for 30 minutes. Put all ingredients in a small bowl and add cream last. Cover with clear film and put in the refrigerator. Purée the tomatoes in a blender and pass them through a fine strainer. Heat the olive oil in a frying pan over medium-high heat, add the bay leaf, ginger and garlic and sauté for about 1′. Then add the tomatoes, cumin, fennel, chili and lemongrass and cook, stirring occasionally, for about 7-8 ‘. Add the coconut milk, taste and adjust seasonings with salt and continue cooking for another 3-4 ‘. Preheat oven to 200°C. Take the fish and the second marinade out of the refrigerator and let them come to room temperature. Spread the spice blend over the fish in the pan and add the second marinade. Bake for 12 to 14 ‘. Serve the fish spreading the tomato sauce around it.